Throughout, Bobbie Cole writes with an openness of heart, offering some humor that is refreshing, keeping the reader engaged every step of the way. Offering hope to the many who believe that God is distant and not involved in our everyday lives, Bobbie describes her encounters with God that changed her life forever. This is a story worth reading that gives hope to the broken and offers inspiration to those who are on their own faith journey to healing in Jesus Christ. Each chapter builds into a beautiful love story as the author writes of her travels to Israel, revealing the love that God has for His children, especially during times of sickness, lack and heartbreak. Inspiring and insightful, women will find this Ruth-type redemption a fascinating read. For this woman of Jewish descent, her story is still unfolding, but she will never forget how she was once one in despair. Her hope in God grew as He led her down a new path for her life with the love of her life – her new husband, Butch. Presenting a theme of reconciliation and restoration this beautiful story is one of hope – hope for healing, hope for a new life through Jesus Christ. This is an astonishing testimony, and comes highly recommended for those going through breast cancer or who have been divorced. 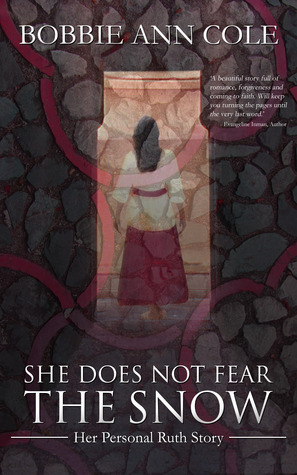 She Does Not Fear the Snow is available at Amazon and in Kindle version. ~ by inhisgloriousname on October 31, 2014.